24-APR-2017: Fix for a potential conflict with Arsil's Toddlers Extra Activities. 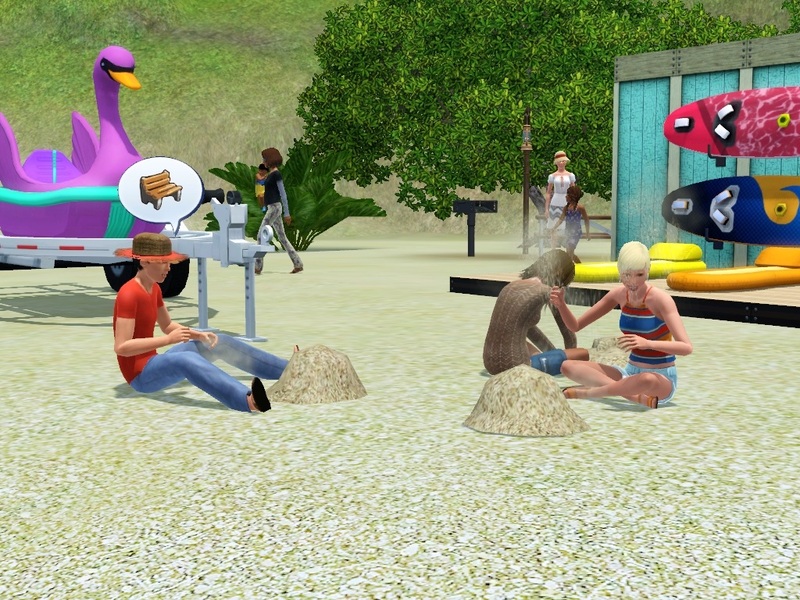 If you use both mods, toddlers should be encouraged to play in the sand autonomously as well. 14-MAR-2016: Sims can now autonomously initiate water balloon/snowball/dew fights on the Family Fun Water Arena. Sims will not autonomously go windsurfing or boating if they are in a group or a date as that tends to take them away from the lot and break the grouping. Blocked sims from using the pool lounger if, due to lack of space, the game places the lounger in body of water other than the one the sim is swimming in. 14-AUG-2014: The option to rent a boat now shows up regardless of where your sim is as long as the mooring post/boating trailer itself is close enough to boat-route-able water to use it. Sims will now only autonomously consider going windsurfing or snorkeling if they are on either a Beach lot or a commercial lot that is partially in the water (Previously they only had to be reasonably close to the water). Placed the same restrictions on the default Go Play In the Ocean interaction so sims should no longer spam (and fail) the interaction whenever they are on the world lot. 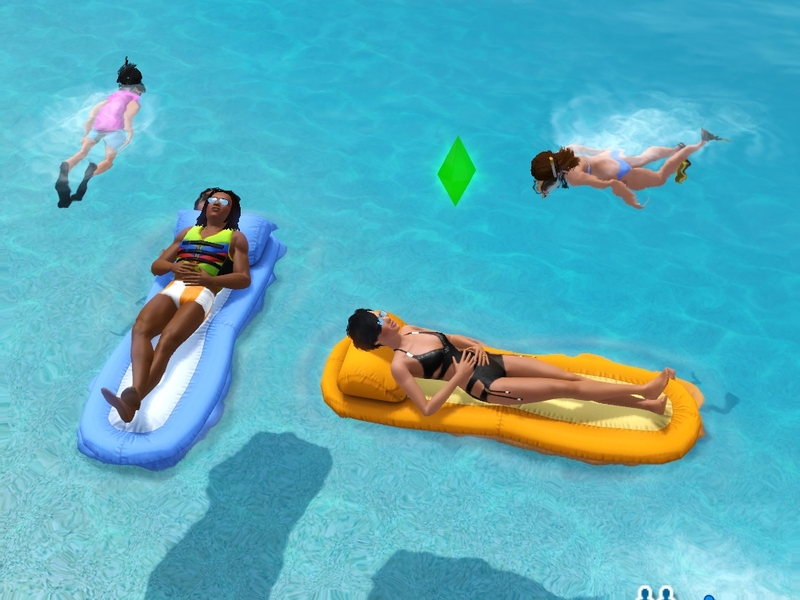 This is a script mod that allows and promotes sims to snorkel, windsurf, go boating, use pool loungers, build sandcastles and have water balloon fights autonomously. Also sims can rent boats for fun from mooring posts/boat trailers on community lots using a new custom interaction. Read below for more details. You may be asking why I made this script mod specifically, since most usually to make an interaction autonomous/more autonomous an ITUN tuning mod should suffice? Relax (Pool Lounger) Inactive sims could autonomously grab loungers out in the open even if they didn't own them but since they couldn't return them back on their own that was a bother Sims will no longer use pool loungers that they do not own. Play In Sand Only child sims could autonomously be pushed to play in the sand despite Island Paradise unlocking the activity for sims teens and above. Also nothing was preventing sims from building sandcastles under snow. Sims aged children and above can autonomously be pushed to play in the sand. They can't do this if the sand is covered in snow. Sims will now only autonomously consider going windsurfing or snorkeling if they are on either a Beach lot or a commercial lot that is partially in the water. The same restrictions on the default Go Play In the Ocean interaction so sims should no longer spam (and fail) the interaction whenever they are on the world lot. Windsurfing Board, Pool Lounger and Boat "Rentals"
For some reason using the lounger in the lakes of Lunar Lakes is impossible, no such problem in every other world I've tested on. When snorkeling in shallow water sims may start clipping into the land beneath the water. Should not conflict with any other mods since this is a script mod and all the ITUNs in the package are custom ones unique to the mod. The Jones' for S3PE All the script modding tutorials out there.